Atlanta Real Estate Forum congratulates BCC Builders for winning a Gold OBIE Award in the Single-Family Builder – Detached (Builds 1-25 Homes/Year) $900,000 to $999,999 category for a new home at Serenbe, a new Fulton County community in Chattahoochee Hills. Presented by the Atlanta Sales and Marketing Council, the OBIE Awards are the premier awards given in the Atlanta new home construction industry. 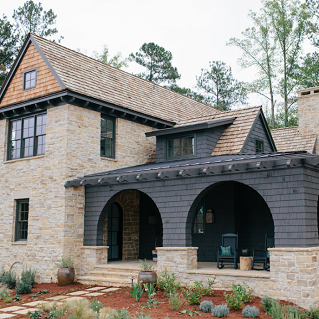 Designed for a healthy lifestyle, this home was the 2017 Organic Life Showhouse in Serenbe in addition to being used for a case study by Wellness Within Your Walls, a program designed to guide home builders and homeowners through the process of using materials containing no toxic or harmful chemicals and incorporating proper off-gassing techniques and procedures throughout the build. Additionally, this home is Earthcraft certified. This home, offering four bedrooms and four-and-a-half baths, was designed by Dana Lynch of Dana Lynch Designs and Jillian Pritchard Cook of Des-Syn. Architectural design by J.P. Curran of Curran & Co. Architects. It features a yoga and meditation studio along with a lap pool. Heavily influenced by nature, this home reflects simplicity. To learn more about BCC Builders, visit www.BCCBuilders.net.